Threads all types of bobbins quickly and easily. The hexagonal shape prevents the tool from rolling off the fly tying bench. The back end of the threader doubles as a half hitch tool. Ergonomically designed for easy handling. Swivel tubed handle rotates smoothly, allowing for quick and easy tie-off of thread. Standard length suits most hook sizes. Arrow point, curved surgical grade edges have micro serrations for trimming and cutting fine materials. Arrow points allow for very close cropping of hackles, wings and other materials. Great for fine tuning the head of a fly. Curved points make contouring fly bodies and wings quick and easy.  Curved, micro serrated edges are ideal for contouring fly bodies and wings.  Ergonomically designed for comfort and ease of use.  Extra sharp precision ground blades stay sharp for a long period of time.  Durable, high quality finish will last a lifetime. These Spring Action Scissors have surgical grade cutting blades, spring loaded for quick and easy cutting. The razor sharp blades are always open, ready for use. Extra fine points aid in tying midge patterns and doing finish work around the head of a fly.  Surgical grade stainless steel.  Quality finish will last a lifetime. This 3" bobbin uses ceramic sleeve inserts in the tube to prevent line grooves. No more tearing and breaking of thread. Delrin pads provide smooth rotation for the thread spool. The short neck makes this bobbin great for tying small flies. High quality spring loaded hackle pliers with non slip rubber pads grip hackles securely. Will not cut or break hackles. Ergonomic shape provides precision control of the needle point. Brass body is hexagonal and will not roll off your fly tying bench. The handle doubles as a convenient half hitch tool providing quick tie off of the fly. Surgical grade, serrated, razor sharp edges are adjustable insuring proper cutting tension. Ideal for cutting coarse materials like deer hair and synthetics. Extra long 5 straight blade aids in cutting large amounts of material, necessary for larger fly patterns.  Adjustable knurled tension knob keeps blades properly aligned for optimal cutting.  Straight, serrated edges are precision ground and razor sharp.  Ergonomically designed for comfort and ease. Surgical grade, fine pointed scissors are precision ground and sharpened to cut cleanly and closely. Great for fine tuning fly hackles, wings and other parts of the fly.  Extra sharp precision ground blades for quick, clean cutting. 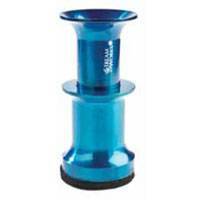 This 4" bobbin uses ceramic sleeve inserts in the tube to prevent line grooves. No more tearing and breaking of thread. Delrin pads provide smooth rotation for the thread spool. The long neck makes it easy to control thread positioning on larger flies. Heavy flared base prevents tipping. Padding reduces noise and scratching of fine surfaces. Polished barrels ensure quick and complete stacking of all types of hair.